More than a week has passed in the new year. How is everyone doing on those 2014 goals? Just in case you intended to make some goals, but didn’t get around to it, you have a second chance: the Chinese New Year kicks off on January 31. Just kidding. Even if you didn’t set goals, you and I know you actually have them. We all do, whether or not we admit them aloud. Whatever they are, I have a few tips to make yours successful. 1. Success breeds success, and generally failure breeds failure. Therefore, it is important to structure your goals in order to generate successes. If you feel good about how you are doing, you are much more likely to succeed than if you are feeling down. 2. You can only meet your goals in the future. The past is past and cannot be changed. If you are like me and in the past you haven’t met all the goals you set for yourself, now is the time to forgive yourself all your past failures. I mean, Right Now! Do it! Nothing good comes from beating yourself up—it’s a negative feedback loop. To thine own self, be kind. 3. Achieving big goals is similar to becoming a marathon runner. You need to start small. Hold onto the vision of yourself running the marathon, but set an initial goal of (say) being able to run three miles without walking. 4. When I was a manager I helped employees make SMART goals: They had to be Specific, Measurable, Agreed (I couldn’t just set them for the employee), Realistic and Timely (i.e. have a specified timeframe). When dealing with yourself, consider Agreed to mean something you want to do, not something you should do. This should not be the Superego dictating goals. Something vague such as “I will become a published author” misses Specificity and Timely. Heck, write a short story and throw it on Facebook and you’ve met that goal, but was that what you really meant? 5. Make a commitment to your goal. If you don’t make a commitment, it’s a wish, not a goal. One approach is to write down the goal. Another way is to announce to others what your goal is. People generally want to help you meet your goals, and letting others know what you want to do allows them the opportunity to help you along the way. I announced two of my 2014 goals on My Two Cents Worth (Before Inflation) blog. They are modest goals, but will take effort. During 2014 I want to attain and maintain a certain level of exercise every month, and I want to lose twelve pounds and maintain that loss throughout 2014. 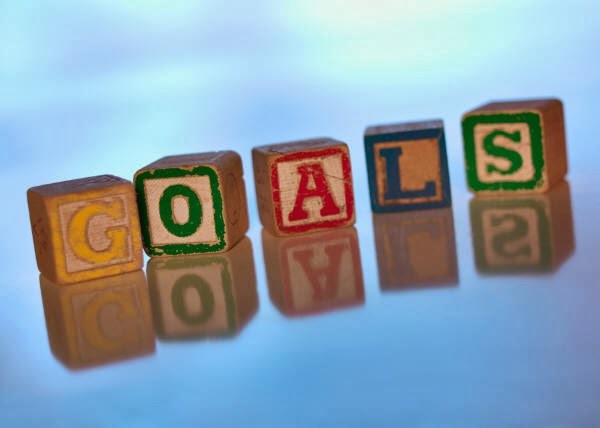 By announcing these goals on my blog, and again here, I can now share my progress (or lack thereof). As I succeed—and I will—I can share that success with others. If I hit a rough patch—for example, a weight plateau before my goal—others can provide support, remind me this is common in weight loss. It’s not just me and my goal; it’s now WE and my goal. Simply having other people paying attention to my goals will help me succeed, because I really do hate embarrassing myself and that provides one more bit of additional motivation that I can transform into positive action. 5. Measure progress frequently. If your real goal is to complete the first draft of the “great American novel” in 2014, you might approach it by (a) estimating how many words that will be (100,000?) (b) setting a smaller goal of 9,000 words in January. And then measure that goal daily. See your writing time produce additional words each time you sit down to write. Congratulate yourself after each sitting—even if you only added two paragraphs and 100 words. And in March, when your son is getting married, back off from the 9,000 words and make your goal only 5,000. 6. Recognize that most goals revolve around developing new habits. Habits take a while to establish and are rarely reached without a minor backslide or two. Every day provides a fresh twenty-four hours. If you slip one day or two, recognize what has happened and get back up on that horse-of-a-new-habit and ride it today. If you have a goal that you want me to pay attention to, share it in the comments. If you have a technique that works for you in reaching your goals, share that as well.